The M.S. program in Speech-Language Pathology offers a Bilingual English-Spanish specialization in speech-language pathology (BIES). This specialization program prepares speech-language pathologists who are proficient in Spanish to evaluate and treat communication disorders in Spanish and bilingual (Spanish-English) speakers. Latinos are currently the fastest growing ethnic population in the United States; in turn, this has created an ever-growing need for bilingual speech-language pathologists. The BIES specialization in speech-language pathology provides students with the necessary training to become competent bilingual speech-language pathologists. Students graduating with master's degrees as well as a BIES specialization in speech-language pathology from Marquette University find extensive job opportunities nationwide, with potential for higher salaries as a result of their area of specialization. Students enrolled in the BIES program are asked to satisfy a set of BIES Competencies that address language proficiency, normative processes, assessment and intervention skills, and cultural sensitivity. 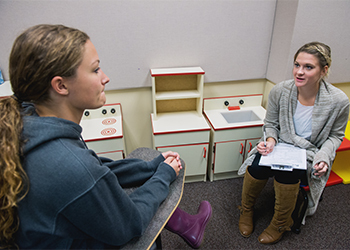 Marquette's BIES specialization program in speech-language pathology is the only one of its kind in the Midwest.